Foooood oh yes, that’s what I wish to talk about surprise surprise!!!!!! I just want to share my delightful experience from one of my evening out this week. I am sure many of you have already heard about the buzz name “Sholay”, well just like the iconic Indian film Sholay, this place is quite unique in many ways. 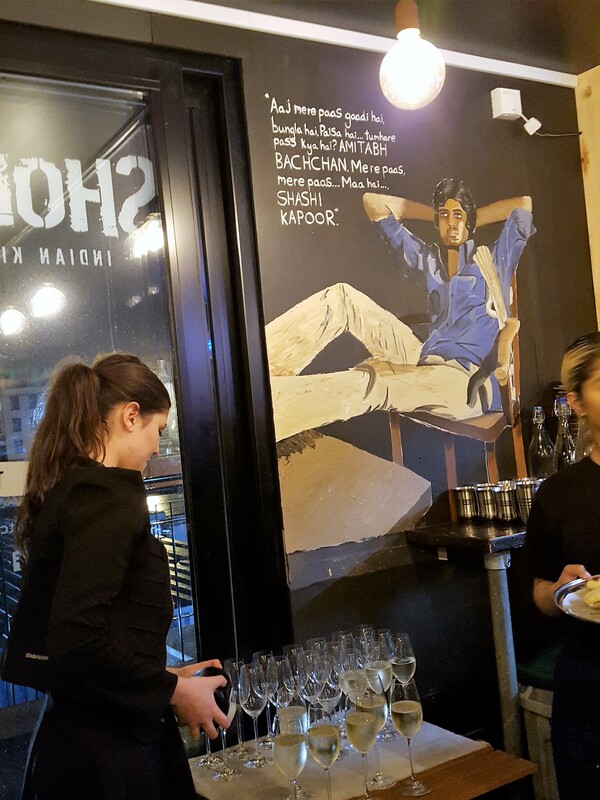 My husband and I had the privilege to have been invited to the official launch of Sholay Pan-Indian restaurant in the bustling city of Bristol Wrapping Wharf, by the harbour side. From the minute we walked in the packed cosy little restaurant, we were greeted with such hospitality and warmth. Greeted first by the lovely Humayun Hussain, (food writer/ hospitality consultant hospitality) known by many in the food industry. The warmth and the decors throughout this cute little place is enough to make one want to casually walk around and mingle. As we arrived I could smell a lovely aroma of food wafting through, my appetite, and taste buds were tingling. I knew we were in for a treat…. I just love the decors, truly Bollywood style with mini quotes from several Indian movies. Yes Mr Bachan, Gabar Singh, Thakur and the beautiful Basantee were certainly in the picture. I am a very big fan of Indian movie, and to dine in a place with a background of Indian songs made me very much at home. 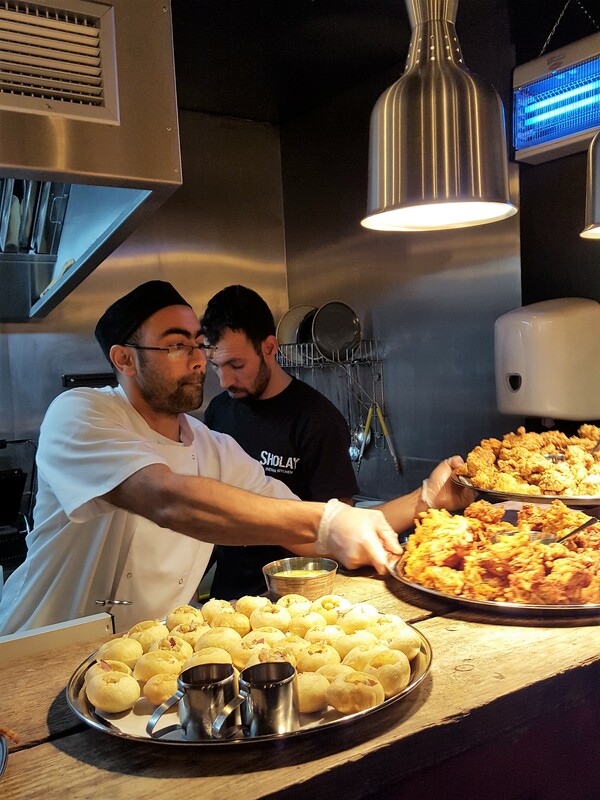 There are still a deep-rooted aversion and melange of dishes when it comes to Indian food, Sholay food menu had the buzz that combined East & West yet keeping within the authenticity of Indian flavours. On the menu was the ever favourite street food, “pani puri” that shouts freshness and zing at one bite. 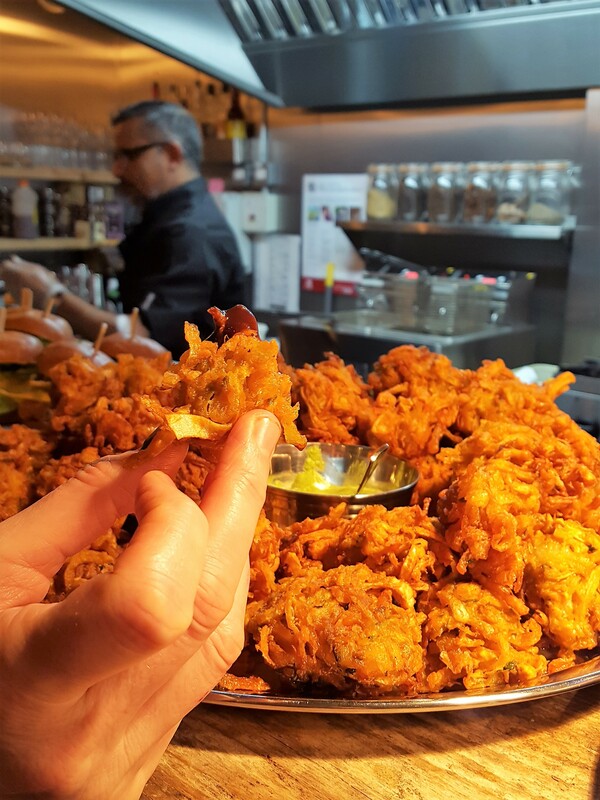 Followed by trays of freshly made crispy, light pakoras with chutney. As one can see behind the scene, a busy team filling in the trays of food. 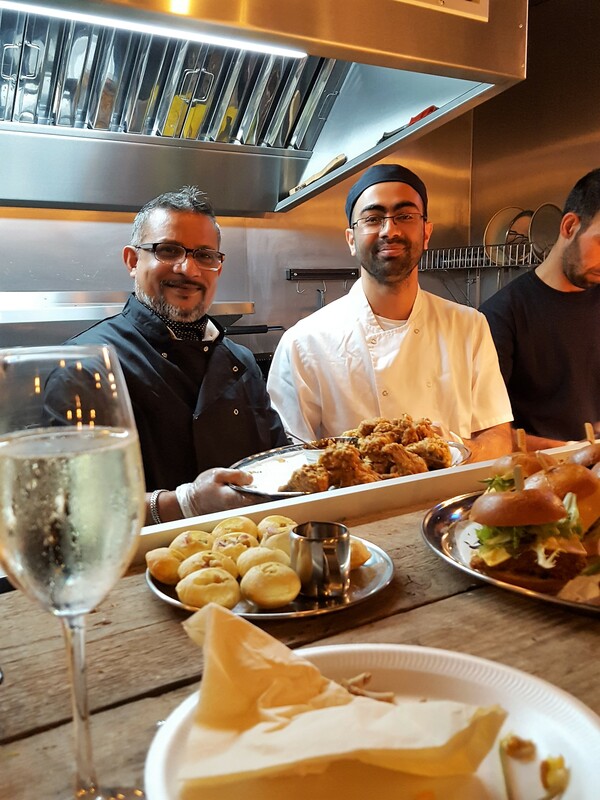 I find it is always nice to see what happens in the kitchen, chefs in action at work in a calm atmosphere is always good vibes. Shami kebab brochettes which were super good, mini chicken burgers with a touch of spice, and several other tasty bites. Accompanied by glass of bubbly or lassi, everything went down a treat. We were totally spoilt with the amount of food on the menu that evening. Every food has story to tell, every time I look at them I see something that attracts my attention. Whether it’s the dish it or the story behind it, but it’s always good to reflect on happy moments that surrounds food. 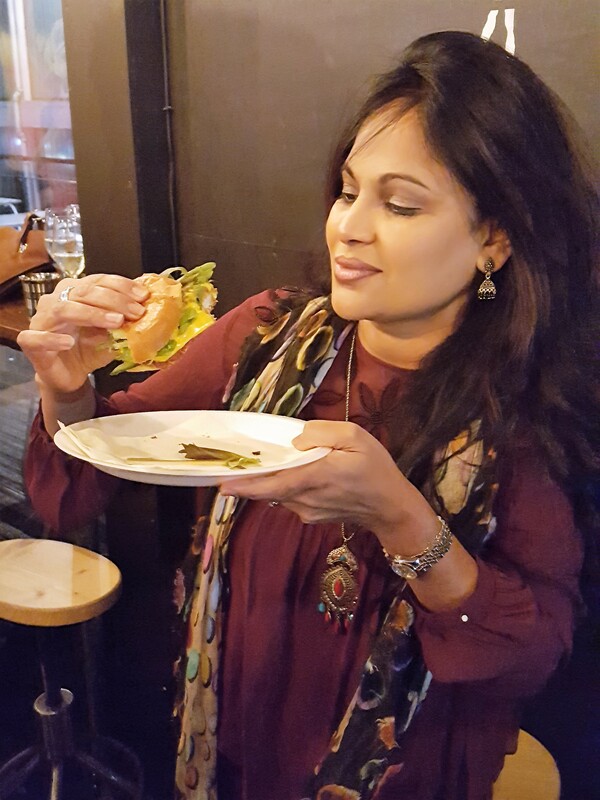 Hence it’s a good excuse for me talk and write about my food experiences….this time my wonderful experience was at “Sholay”. Just browsing through my photos now I am feeling hungry and thirsty. I will now let you browse through the photos below with very few captions. 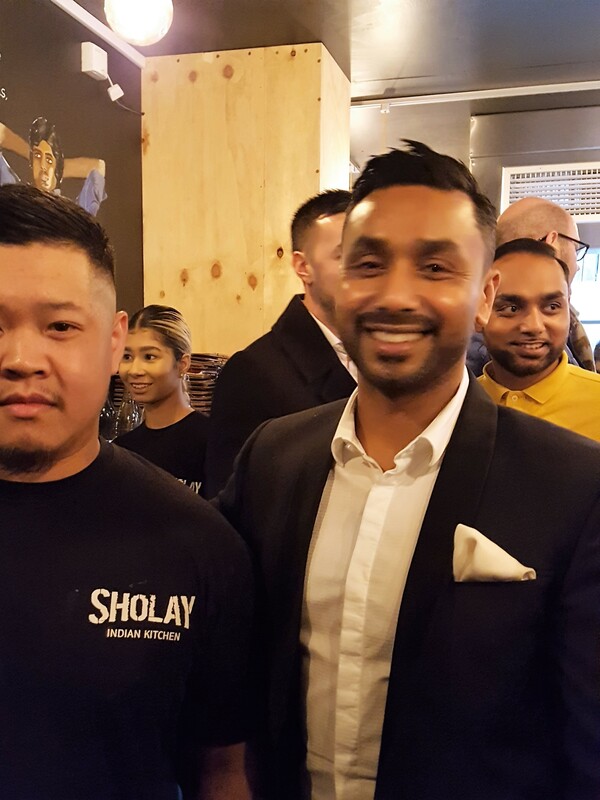 Those of you who have tasted the food will relate to my story, and if you haven’t been there yet, I suggest to visit Sholay very soon. 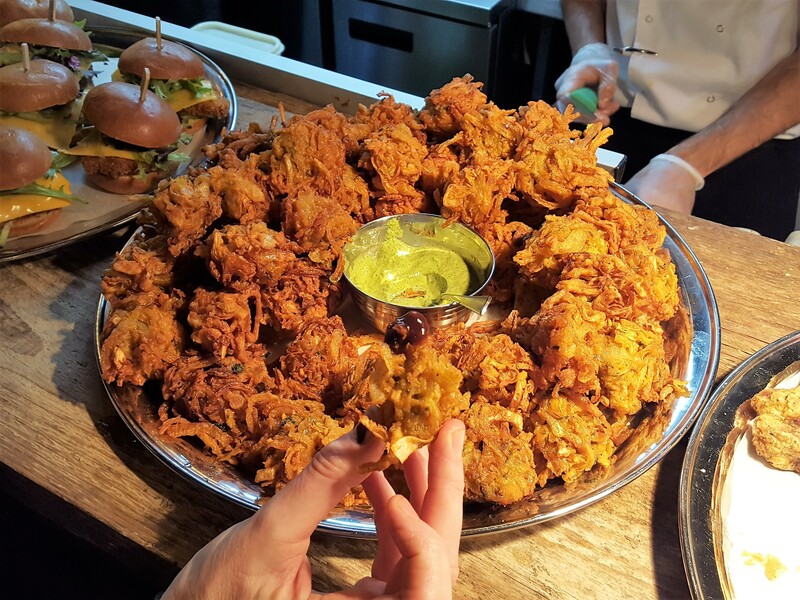 It is a great place to chill out with food and drink while overlooking the Bristol harbour. Thank you Luth Rahman and the Sholay Team, Humayun Hussain for you kind hospitality.